Although some have accused me of apostasy, I am not an apostate. And, despite allegations of heresy, I do not consider myself a heretic. opinion or doctrine at variance with the orthodox or accepted doctrine, esp. of a church or religious system. Doctrinal purity tests generally irk me. One reason is that I fail them. I know enough ecclesiastical history to state confidently that, within the Western Christian tradition alone, the Roman Catholic magisterium has redefined aspects of orthodoxy more than once. One might point to the case of Origen (185-254), one of the Ante-Nicene Fathers. He was orthodox, especially with regard to Trinitarian theology, during his lifetime. After the First Council of Nicaea (325), however, he became a heretic of the ex post facto variety. Furthermore, many of the items on doctrinal purity tests are not key to salvation. My rejection of the Virgin Birth, therefore, should not marginalize me theologically. I have always been intrinsically intellectual. The dominant form of Christianity around me during my formative years was anti-intellectual, reactionary, Pietistic, and revivalistic Protestantism. It never fit me. I have also always been an introvert. Thus the contemplative traditions of Roman Catholicism and Eastern Orthodoxy have appealed to me. Also, the extroversion typical of Evangelicalism has alienated me from Evangelicalism. No, ritualism, contemplation, and dispassionate intellectualism have defined my spirituality. Recently I have heard, in close quarters, condemnations of my “apostate” Episcopal Church. I have rejected the adjective, of course. If, however, the reasons for the allegation of apostasy are related to ecclesiastical support for social justice, I embrace the label of “apostate” as a badge of pride. Yes, I support full civil rights for all human beings, including homosexuals. I reject homophobia, for I recognize the image of God in people, many of whom are quite different from me. Yes, I favor the ordination of women. Equality via the Holy Spirit is a wonderful lesson to learn from many strands of Christian tradition. I understand that these positions are, according to many of my fellow Christians, heretical, if not apostate. So be it. I can do no other. Various mysteries of the universe perplex me. One of these is why, in the name of Jesus Christ, so many self-defined conservative Christians adopt political positions that would make Atilla the Hun look like a card-carrying member of the American Civil Liberties Union (ACLU) by comparison. In this context I feel comfortable claiming the tribe of alleged heretics and/or apostates as my own. In so doing I identify with Jesus, friend of outsiders. One does not plead for the use of incense–Presbyterians are not likely to come to that–but at least one may protest against mistaking a general odor of mustiness for the odor of sanctity. Foreman’s words struck a chord with me a few years ago, when I found the quote while conducting research. In fact, I chuckled quietly, as I was in a library at the time. And, as I have affirmed since, Foreman was correct. The worship of the living God ought to be an activity characterized by decorum and great dignity. This attitude of mine explains why I dislike revivalism, the Pentecostal and Charismatic movements, and contemporary worship, and why I gravitate toward good liturgy. And yes, I like the use of incense. Some of the rural United Methodist congregations my father served in southern Georgia, U.S.A., were musty by Foreman’s standard. Prolonged exposure and subjection to bad liturgy starved my soul. Now, fortunately, good liturgy has become my steady diet. The biblical Psalms may well have functioned as a prayer book for the people of Israel. Some of the earliest Christians compiled their advice about forms and patterns of worship into church order documents, the first of which, the Didache, dates back perhaps into the first century A.D. Over time, especially in the early Medieval period, these documents grew very complex, with detailed instructions about every aspect of worship. Despite this tradition, most evangelical and even many Reformed and Presbyterian congregations in North America have resisted the use of formal service books and set liturgies. This resistance resulted partly from the influence of Puritan critiques of “by the book worship, which were much more stringent than critiques offered by the Reformers. Other influences included the formation of early Methodist, Baptist, Anabaptist, and other “free church” congregations. as well as the spread of North American populism, pragmatism, and revivalism. Congregations in many streams of North American Christianity have long resisted being told how to structure worship and have cherished their ability to respond to their own preferences and sense of what is most effective. As a result, thousands of North American congregations today owe a great deal both to both a two-thousand-year history of service books and to the legacy of North American freedom and populism. In recent years amid remarkable changes in the practice of worship, hundreds of those congregations are looking for new ways to appropriate both of these aspects of their identity. Some efforts go by the names “blended worship,” “convergence worship,” or even “ancient-future” worship. But despite vast and remarkable growth in contemporary music based on popular styles, many of the best-selling books on worship today are, ironically, studies of worship in the early church, prayer books for formal daily prayer, and books about the recovery of the sacraments. Recent innovations under the umbrella of terms like “postmodern worship” and “alternative worship” sometimes feature even greater interest in traditional forms and texts than in the “contemporary worship” of the 1980s and 1990s–though in configurations that elude easy categorization. Laudable Reformed Christian rituals and service books exist. I point, for example, to the Presbyterian Book of Common Worship (1993) and Book of Occasional Services (1999) as well as to the Reformed Church in America’s Worship the Lord (2005), all of which grace my liturgy library (the Book of Occasional Services as a free PDF). But how many PC(USA) churchgoers know of their Book of Common Worship? 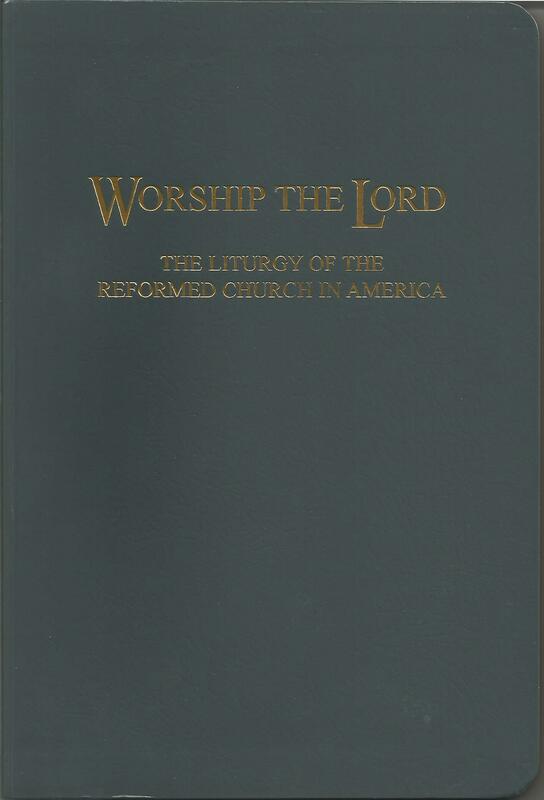 And how many Reformed Church in America worshipers attend congregations which make little use of the 2005 liturgy? In other words, I think of decorum and great dignity–even if the forms are simpler than they are elsewhere. Worship patterns vary within denominations, of course, so this generalization does not apply universally among Presbyterians (or members of other denominations). Yet I affirm the historic Presbyterian commitment to dignity and decorum in worship. There is a High Church Presbyterian movement; it has existed in its renewed form since at least the middle 1800s. I have availed myself of archive.org and downloaded certain congregational and semi-official and official service books from Reformed churches. 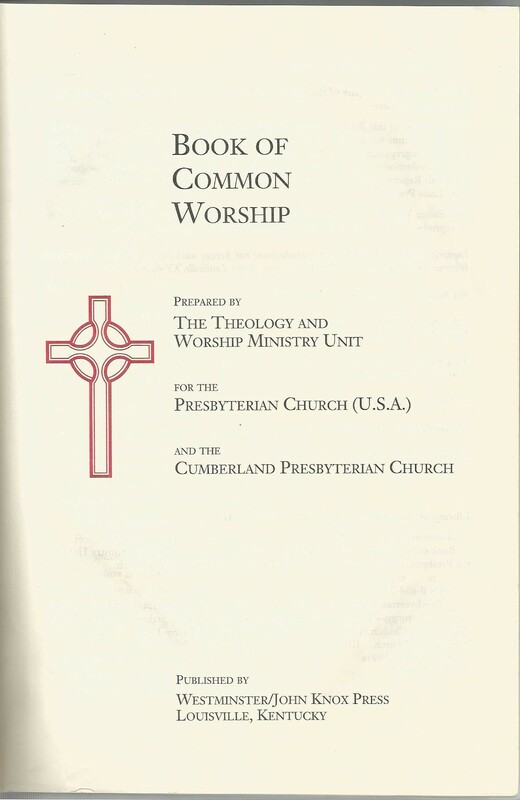 Such downloaded files join volumes, such as every edition of the U.S. Presbyterian Book of Common Worship (starting with the 1906 edition) as invaluable parts of my liturgy library. I have found denunciations of these “Episcoterian” tendencies in certain online forums. Perhaps the authors of some of these posts need to review the history of their own tradition and ponder Professor’s Foreman’s critique. I will be in my Episcopal parish, bowing to the high altar and to processional crosses most Sunday mornings. I spent much of my childhood taking the grand tour of the South Georgia Conference of The United Methodist Church. Moving as often as we did proved detrimental to me, an introvert. Now, however, I am glad to report, I have lived in the same town for almost eight and a half years and in the same home for almost six and a half years. Such stability would have been unimaginable during my youth. Recently I have been examining my photographic albums. Looking at pictures from decades ago has dredged up old memories, which I have not revisited for some time. Memories of awkward childhood incidents have reminded me of how much I have changed and how fortunate I have become. They also remind me of how blessed I am to have found a place I fit in–St. Gregory the Great Episcopal Church, Athens, Georgia, which I have attended since August 2005. I am outcast no longer. 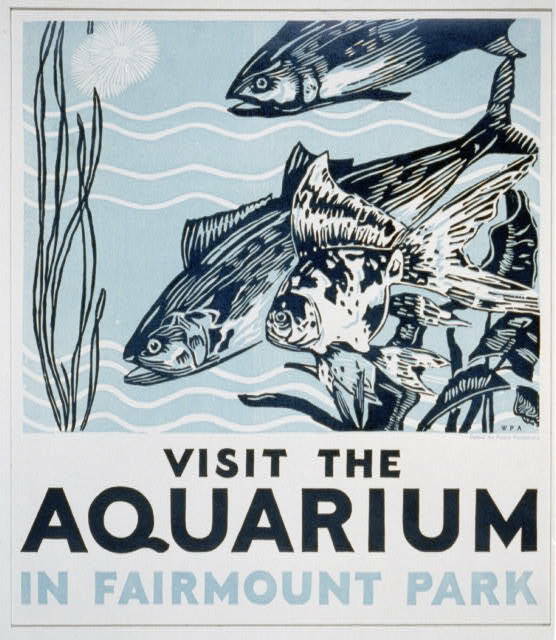 My main memory of my United Methodist childhood in southern Georgia is that I lived in a series of proverbial glass houses–fish bowls or aquariums. Many people–especially church members–held me to a higher standard than they did others, perhaps even themselves–or at least that was the impression with which I lived. I went through life with the sense that I was always “on stage”–a terrible way to live. I never got into any serious trouble as a youth. My adolescent rebellion consisted mainly of modern art and modern classical music, in fact. Whenever morality failed to regulate my behavior, fear of consequences did the job. But I affirmed then what I repeat now: There should be just one standard–one informed by graciousness and forgiveness. Now I live in the liberty of a lay person. Now I ca say and write safely basic sentiments which would have been risky when I was growing up and having to think about potential blowback upon my father, mother, sister, and self. (My father’s public support for the Martin Luther King, Jr., federal holiday contributed to his move out of one racist town in the 1980s, so I am not referring to especially incendiary material.) It is good to be among the laity. So, if any of you, O readers, seek a positive lesson to learn from this post and to apply to your lives, here it is: Do not hold your clergy people and their family members to a double standard. No, think and act graciously, in a forgiving manner. The population of Athens-Clarke County changes as students come and go, retirees move to town, and people move away or die. Thus the congregation of St. Gregory the Great Episcopal Church, Athens, Georgia, my parish, has an ever-changing quality about it. I have been here since August 2005, so I will, God willing, begin my ninth year at St. Gregory the Great Church, in a few months. 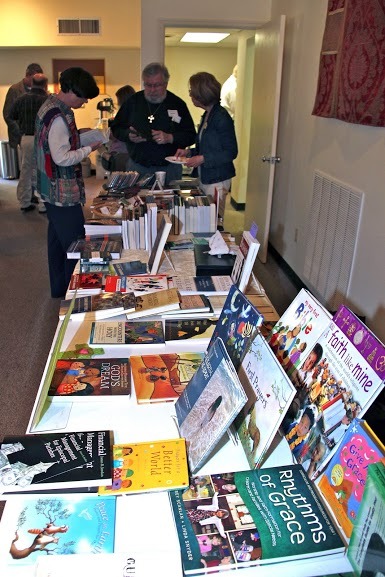 I have seen graduates move away, members migrate to other churches (including the other Episcopal congregation in town), come from other churches (including the other Episcopal congregation in town), and come to faith in our midst. People I have come to like and respect very much have died. And I have forged new friendships. I look out from my perch in the choir (along a back wall) and see clergymen of other denominations. One retired pastor of the Evangelical Lutheran Church in America (ELCA) congregation in town died recently; he had attended services at St. Gregory the Great Church for years. His widow continues to attend. A United Church of Christ (UCC) minister and his family have joined our community. A more recent addition to the community is Gordon Bienvenue, a retired United Methodist minister, of whom I have more to write, all of it positive. Gordon and Katie, his wife, have become integral parts of St. Gregory the Great Church. I have not had the opportunities to interact with them as often as I would like, but hopefully time will correct that. Gordon writes lovely icons. He has delivered sermons, something he has been glad to do. Gordon has also assisted at the altar, distributing communion bread and gluten-free wafers, sometimes with planning and sometimes not, but always to the priest’s relief. Our Rector is Beth Long, of whom I have only positive comments as a priest and a human being. She is to my theological left. I, after having spent too much time as the resident heretic in a succession of congregations, find myself, without having changed my mind much, on the relative right in a church. Actually, I enjoy learning from people to my left. I even relish the fact that they are there. And I do to them as I wish many people to my right had done to me. Beth is, simply put, well-equipped for her duties. She is in the right place at the right time. And I thank God for her and that fact. Beth, due to canonical reasons, may consecrate the bread and wine of the Holy Eucharist at St. Gregory the Great Church, but Gordon Bienvenue may not do so. (I would not object to those with the power to change that rule doing so.) Anyhow, an allergy has affected Beth’s voice adversely recently. A few Sundays ago Gordon preached. Later, after Beth had done what the canons required her to, she rested her voice and Gordon distributed the bread and gluten-free wafers. Last Sunday, as Beth began to distribute the bread and the gluten-free wafers, her voice required rest. So Gordon stepped up and took up the task. Beth was glad. It is good to attend church with such people–individuals who serve God gladly, with or without notice.